Saturday July 5th 1924 I went to town in AM to see Dr Ned Smith about my eyes. Rode home with Rob. The girls at their home all PM. I did some sewing. Hattie & I home in the evening. Sunday July 6th 1924 I did not get up till nearly noon. I did some looking over things in the PM. Tishie Hedges here awhile. We rode up to the other place after supper. Hattie & I down to Otts. Monday July 7th 1924 I am covering some coat hangers. I did some washing. The girls up to the other house most of the day. Hattie & I here in evening. Tuesday July 8th 1924 Cora packing barrel for her Mother in AM. Hattie at the other house. Normia away at a wedding. A letter from Lydia tells Jane & Art reached there Saturday PM by Auto. 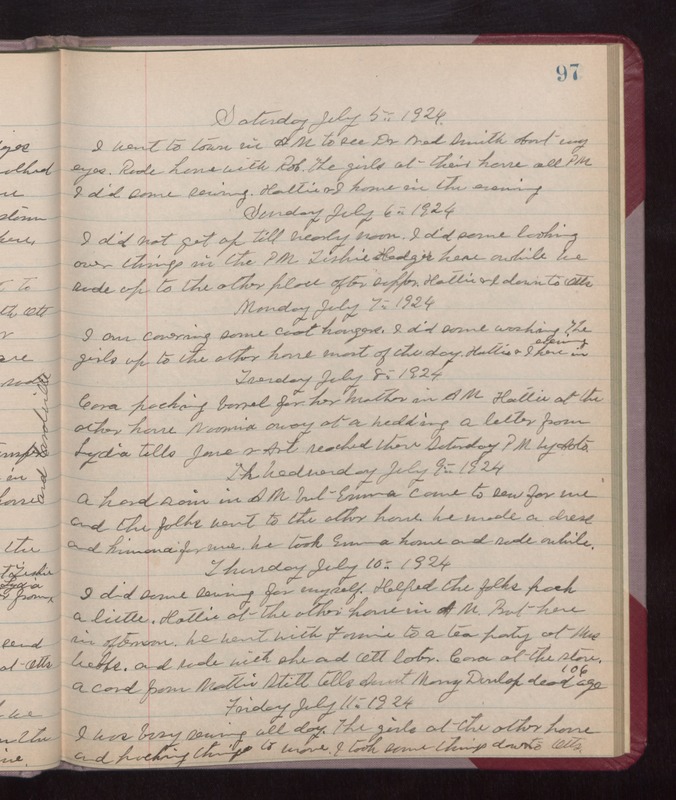 Wednesday July 9th 1924 A hard rain in AM but Emma came to sew for me and the folks went to the other house. We made a dress and kimono for me. We took Emma home and rode awhile. Thursday July 10th 1924 I did some sewing for myself. Helped the folks pack a little. Hattie at the other house in AM. But here in afternoon. We went with Fannie to a tea party at Mrs Webbs and rode with she and Ott later. Cora at the store. A card from Mattie Stitt tells Aunt Mary Dunlap dead age 106. Friday July 11th 1924 I was busy sewing all day. The girls at the other house and packing things to move. I took some thing down to Otts.